As we entered the Border Country Inn on Easter Sunday. This persistent Ms. Kudu decided to eat out of the container rather than the few pellets in my hand. Yesterday, while wrapping up the post, Louise sent me a text message (I use Messenger in Facebook) asking if we'd be interested in going out to lunch with them at a great restaurant, the Border Country Inn, just outside of Komatipoort located next to the border of South Africa and Mozambique. The entrance to the hotel and restaurant was welcoming. ﻿Although neither of us usually cares to eat lunch, we couldn't miss the opportunity to spend an afternoon with Louise and Danie. Any time we're with this delightful couple, we have an excellent time, whether there's food or drinks involved. Often, one or both of them stop by to see us during the week and with work often on their minds, we can sense their need to get back to work before too long. 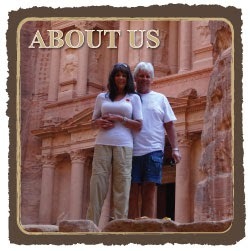 They're a very busy couple managing many vacation rentals and with Danie's construction business. We never seem we have enough time together. These flowers, cannas (thanks to input from reader Annie in Florida) were a nice sight. There aren't many flowers blooming in the bush. ﻿The idea of spending free time with them both made us jump at the lunch invitation. They agreed to pick us up at 12:15 and we'd be on our way. Their plan was to take us through the "back roads" which proved to be a totally unexpected foray into the "real" Africa, as they explained. That's not to say that we aren't living in the "real" Africa. Our experiences may be unreal but not all of South Africa is like Marloth Park, a world unto itself, unique, breathtaking and beyond the dreams of most travelers. The restaurant was pleasing to the eye and surprisingly comfortable in this wrought iron chairs. We'll be sharing more photos from yesterday's highly enjoyable outing. Today's post revolves around the dining experience while tomorrow's post will include photos of the exquisite scenery we encountered on both legs of the journey. Usually, it's challenging for me to find appropriate food in restaurants for my special way of eating. Fortunately, both Louise and Danie follow the Banting Diet which is comparable to my diet, both achieving major health benefits. For details on the Banting Diet, please click here. Louise ordered this good-sized chef salad with roasted chicken slices. Based on their suggestion in choosing Border Country Inn for lunch, I had no doubt I'd be able to find suitable options on the menu. However, neither of us had any idea how good the choices would be, along with the affordability, especially on the daily lunch menu. A dear friend of theirs, Jiji, joined us for lunch with his adorable 11-year-old daughter and thus there was six of us for lunch. Louise and Danie insisted we all choose whatever we'd like since they were picking up the bill. We'd wanted to buy them lunch for them for all they've done for us but there was no way to convince them. Danie ordered this dish called, Eisbein, which is a roasted pork knuckle, It looked delicious. ﻿Tom ordered a steak with chips (fries) which he described as flavorful and tender although overcooked for his liking, while I ordered the grilled prawns and calamari along with a side Greek salad (without the dressing) which was excellent. As always, the conversation flowed with ease each of us sharing favorite stories from our life experiences with each so unique and worldly in many ways. That's typical of residents of Marloth Park...we each have our own brand of vast experiences we love sharing with one another. Tom's steak with chips and two vegetable sides. He wasn't too keen on the vegetables and rarely eats them in restaurants, although he'll eat some I make. ﻿When the bill came, Danie knew I'd want to see it in order to share with our readers as to how affordable dining out can be in South Africa by adhering to a few principle facts such as dining times, distant locations and the nature of the anxious-for- diners establishment. All of this is accomplished with little effort. This was my meal which included three prawns with heads (typically served here), grilled calamari and a side salad. ﻿The total bill as shown on this receipt below, for six people with beverages (on the receipt of the left), taxes and tip was only ZAR 600, (US $50.75). Wow! Now our readers can see why we felt returning to Africa was a wise choice, not only for our desire to return to its wonders but also to "lick our wounds" after the pricey Antarctica cruise. This dish that Paulina and her dad, Jiji ordered which is a huge sausage placed inside this pig-shaped dish with baguette slices on the side. ﻿Dining out costs little more than dining in if circumstances are right as listed above. And, yesterday's circumstances were just right when we had the opportunity to spend Easter Sunday with great friends and new friends, over good food and wine. This bar, located next door to the restaurant advises it's visitors to say, "Honey, I'm at the Office." Hahaha. ﻿Thank you, Louise and Danie! You're making this second foray in South Africa even more delightful than the first if that's even possible. We couldn't believe the fabulous lunch for six was so reasonable, around ZAR 600 (US $50.75) for six people. Today at 5:00 pm, we're off to another party at Kathy and Don's bush home across the road from the Crocodile River for more fine conversation, food, wine, and river viewing from their third floor veranda. Life is good. The shoreline in Sydney is packed tight with pricey apartments and condos. For more photos, please click here.